HOW LONG HAVE YOU BEEN A FREELANCER AND WHAT EXACTLY IS IT THAT YOU DO? I consider myself a „multimedia engineer“. Most of my projects involve photography and filmmaking, but I do other stuff as well from time to time – from printed conference newspapers to small web projects. Basically, I am a one-man production company. I don’t have any employees, but I work a lot with other freelancers whom I hire for certain projects. I started as a freelancer in 2007 (part-time besides my regular job) and switched to being a full-time freelancer in 2011. HOW DOES YOUR TYPICAL WORK DAY LOOK LIKE, IF THERE IS ONE AT ALL? Like most of the freelancers in the media business, I don’t have a typical day. In some weeks I am on (photo or film) shoots for a couple of days, in other weeks I am behind my desk doing all the editing or the “boring stuff” (writing offers/invoices, doing the taxes, … ). 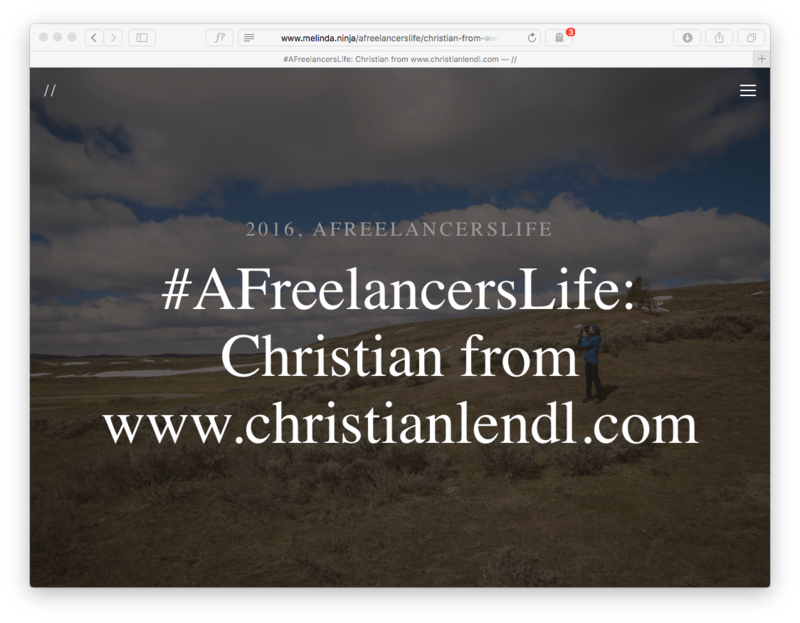 WHAT EXACTLY DOES YOUR FREELANCING WORK ENTAIL? Pre-project work mostly consists of writing offers, concepts and coordinating project details with the client. Photo projects are mostly (in simplified terms) about going somewhere, taking pictures and then editing them – I mostly do documentation/reportage and business portraits for B2B clients; I don’t do beauty, commercial ads or weddings. I am not a big fan of retouching (actually I hate it) and fortunately I don’t have to do it very often. For portraits, I almost always work with make-up artists – if they are good, not much ( any) retouching is needed. Filmmaking projects are a bit more complex. Much more coordination is needed before I can press the REC button on my camera: finding out exactly what the client wants, what the intended purpose of the video is, writing a script, etc. As with photography, I mostly do B2B projects (no Hollywood-style action movies). Filming itself can also vary from short interviews where I work alone to bigger productions where I work with various other freelancers. I also do the post-production (editing, audio production, graphics, …) for most of my projects. WHAT HAS BEEN YOUR BIGGEST HIGHLIGHT SO FAR AS A FREELANCER? I went to the USA with Richard and Bernhard to film “Projekt Silva”, a documentary about a treasure hunt. Nearly two weeks of filming in the Midwestern USA was definitely one of the most exciting projects I have worked on! Another highlight was a project for a sailing company, for which we got to spend two weeks in the Caribbean on a catamaran producing an image video. HOW DOES YOUR PREVIOUS EDUCATION AND EXPERIENCE TIE IN WITH YOUR CURRENT FREELANCER WORK? Originally I went to a technical college for mechanical engineering and studied computer science at the University of Technology in Vienna. So that doesn’t really have much to do with photography and filmmaking (except some courses at the Vienna UT where we did some basic video production)… Photography (and later, filmmaking also) started as a hobby and then became a job over the years. DO YOU SOMETIMES HAVE MOTIVATIONAL LOWS, AND IF SO, WHAT DO YOU DO TO GET OUT OF YOUR LOW? Yes, of course – like everyone else, I guess. For short-term lows, coffee and chocolate help – or having a short break and going for a spin on my bike. Playing a couple of songs on the drums (which are placed right next to my desk, fortunately) also helps to relieve stress. WHAT DO YOU LOVE ABOUT BEING A FREELANCER? WHAT DO YOU HATE? The thing I love most is the freedom of time management. Half a day off to go biking? Great, no problem! I can choose my own office hours (most of the time). Sure, if my clients book me for a certain time and date, I have to be there. And yes, there are weeks where I don’t get any free time at all. But that’s not the usual situation. What I hate? That the Austrian Government doesn’t give a sh*t about self-employed people. The social insurance system is a mess and the forced membership in the Austrian Chamber of Commerce is a pain in the a** – just to name two examples. HOW DO YOU STRUCTURE YOUR DAY: WHEN ARE YOU TAKING BREAKS, WHEN ARE YOU WORKING, WHEN ARE DOING WHICH TASKS IN PARTICULAR? As every day is different (photographing on location vs. editing videos at my desk), I don’t have a usual structure. When I’m behind my desk I try to answer client emails and write offers in the morning. I take breaks every now and then, especially when the computer is doing some CPU-intensive work (like rendering video files). I am really productive in the evening (maybe until 1 am), so I often have a longer break (bike ride) in the afternoon and continue working until midnight. WHICH ARE YOUR FAVORITE 3 WEBSITES/APPS YOU’RE USING ON A REGULAR BASIS REGARDING YOUR FREELANCE WORK? Weather Pro (iOS) – IMHO the best weather app for iOS. It’s always good to know what the weather is going to be if you have an outdoor photo shoot. Excel (Mac) – Yes, I am a nerd and I love playing around with formulas in Excel. TELL US ABOUT AN EXCITING PROJECT YOU HAVE WORKED ON WHICH MADE YOU PROUD. Apart from the above-mentioned “Projekt Silva”, there is a tiny little project I did for myself: “But first, coffee”. Originally, it was just supposed to be a test shoot for my (then) new camera (just my camera and me in my kitchen; I’m also the one making the coffee), but after putting it online I got so much great feedback from various professional baristas and coffee lovers.